Amon’s Droids Killed My Audio is an over 40 minutes long ep. 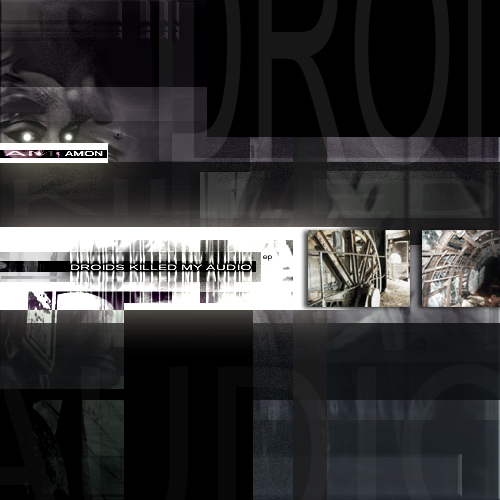 Droids Killed My Audio’s music switches between genres of dark ambient and noise terror. Most of the tracks are mainly dark ambient with occasional noise bursts and short minimal melodies. The r ich sound world of synthetic effects, sub bass lines or flute melodies form an interesting collage of sounds. That’s the best word to describe this ep: a sound collage. The first three parts (Droids Killed My Audio, Revive and Kiro) and the 8th part (Divinator) are maybe the most easy to listen to tracks though the occasional clipping bursts really can make you wonder what the hell is going on. The rest of th e ep is something most of people won’t understand but will be a heaven to those who like noisy stuff and especially noise made by intelligent usage of the technology available. The 4th, 5th and 6th part (Tilt Goddes, Evil and Shaquan) are probably the weirdest tunes here with fast altering of effect parameters and heavy filtering combined with heavy distortion. The 7th part (Droid-Comm) links the noise of Shaquan (dk maudio6) to the smooth floating ambient of Divinator (dkmaudio8). The best bits on this ep are the 1st, 3rd and 9th tracks. They all have a certain identity that differs them from the rest of this ep. They all are crafted very well and the layers are combined so that they can be thought as whole entities. I would say these three tracks give you the best image of this ep.